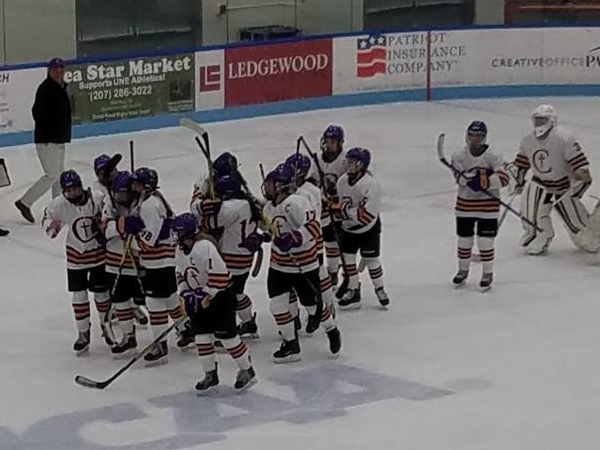 BIDDEFORD—Two cousins who have played a lot of hockey together in their young lives produced a goal which allowed the Cheverus/Kennebunk co-op girls’ hockey team to end St. Dom’s’ lengthy win streak Saturday afternoon at the Harold Alfond Forum on the campus of the University of New England. Cheverus/Kennebunk, which lost by nine goals to the two-time champion Saints a year ago, came out strong and took a 1-0 lead midway through the first period when junior Zoe Mazur set up freshman Emma McCauley, her cousin, for a goal. Cheverus/Kennebunk had ample opportunities to extend their advantage, but never did and while St. Dom’s had some looks of its own, Cheverus/Kennebunk controlled the puck most of the way and relied on its defense and senior goalie Anna Smith to frustrate the Saints as it went on to an inspirational 1-0 victory. Cheverus/Kennebunk improved to 6-0 on the season, dropped St. Dom’s to 3-1 and in the process, ended the Saints’ state record, three-year win streak at 29 games. Read the full story at The Forecaster.